Does that surprise you? Why? One aspect of humor is that of relationships – sometimes polar opposites – one thin clown, one fat clown (Laurel & Hardy, Abbot & Costello). 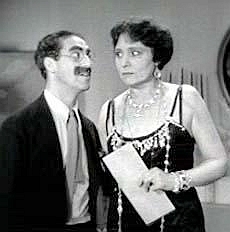 Or prim vs. outrageous (Margaret DuMont & Groucho Marx). Of course, our customers already know that ThoughtOffice absolutely shines when it comes to exploring relationships between things, ideas, and circumstances. Our Comic Genius bundle is specifically designed to help comedians and writers explore humorous relationships through word & image associations, song lyrics, or keywords and phrases. As you can see, you can quickly generate a list of funny words using the ThoughtOffice IdeaBrowser. I know this is kind of equivalent to looking up the word ‘fart’ in the Oxford English Dictionary, but you get the point. All included in ThoughtOffice. Right out of the box. Better get started. The next big (funny) thing is inside you, pounding on your rib cage like a drunken orangutan, trying to get out (and published). Take advantage of our current specials, and you’ll be crafting new witticisms faster than you can say… um… eh… something… that doesn’t take very long to say. Um. And is devastatingly witty. Yeah.